The perfect companion to your lounge chairs, rockers and gliders, our LuxCraft Coffee Table completes your collection of outdoor Amish furniture and provides the perfect spot to keep drinks, phones, sunglasses, reading materials and more nearby. This Amish coffee table provides a spacious tabletop with a handy shelf underneath that runs the length of the table. Whether you're sitting poolside, among the flowers in your garden, or in your porch rocker sipping coffee, this charming table offers serving space and storage with style! Be sure to visit our DutchCrafters blog for a fantastic post with information on using Accent Tables as Design Statements! Review our vast selection of Amish Made Outdoor Chairs to select the right partners for your pine coffee table. 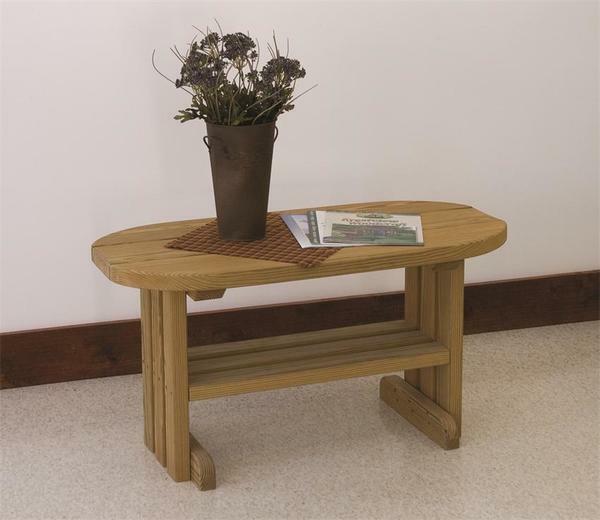 Your pine coffee table is handcrafted in Ohio by experienced Amish craftsmen. Pressure treated kiln dried yellow pine is full of benefits and ensures your Amish coffee table will last! This outdoor coffee table usually ships within 1-2 weeks of purchase.